My name is Jordan Hu. I am a Taiwanese American graphic designer originally from the rooted suburbs of Central Jersey. Having grown up in America, I constantly traveled back and forth to the country. As a result, my work is influenced by the illustrative and youthful aesthetic of Taiwanese design. That, and also an abundance of free flowing authentic bubble tea. 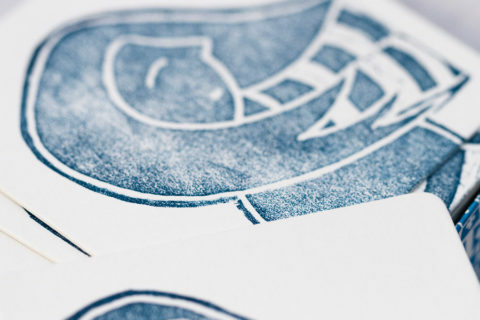 I am currently working as a freelance designer, working primarily with smaller scale clientele. You can find a sample of my work here. The idea for this project came from an assignment for a packaging class I enrolled in the spring semester of my senior year at RISD. The assignment asked every student to select a poorly packaged toy to redesign. The main objective behind this project was to explore structure/form and its role in human interactivity with the product. 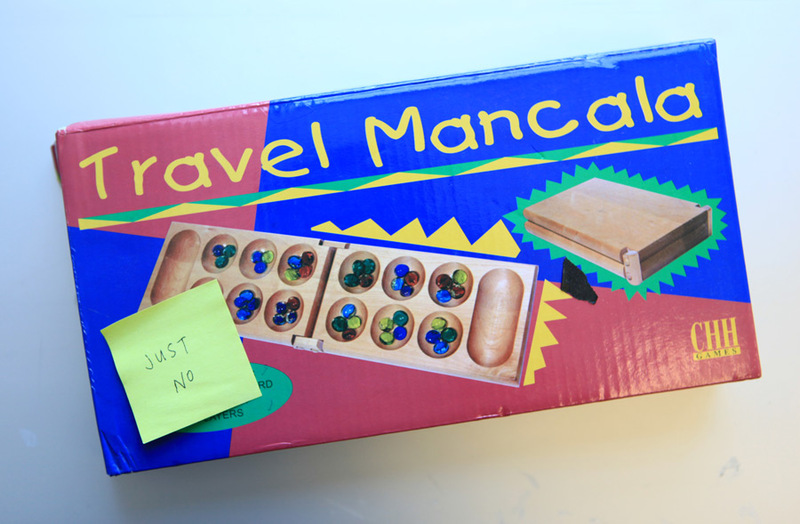 I selected Travel Mancala to repackage because it was actually a game I grew up playing without ever knowing the name. As the board itself doesn’t contain any secondary information, it merely existed as “that game with holes” to me. Having a chance to look back now, there is an obvious void between informational context, identity and the actual gameplay. Ultimately, the biggest problem with the original packaging aside from design clarity is a common relationship with the actual product. Without the external packaging itself the game board becomes irrelevant, completely exclusive towards anybody who doesn’t know how to play. Thus, the ultimate objective for this assignment was to find a common ground by harmoniously integrating more of a historical and cultural context in the gameplay. The first week was spent exploring the possibilities with the structure and form. As I relentlessly spitballed ideas out, the result always came back to being a box and having the game placed inside. I began to realize that the rectangular frame was rather restrictive and limiting due to its lack of versatility. 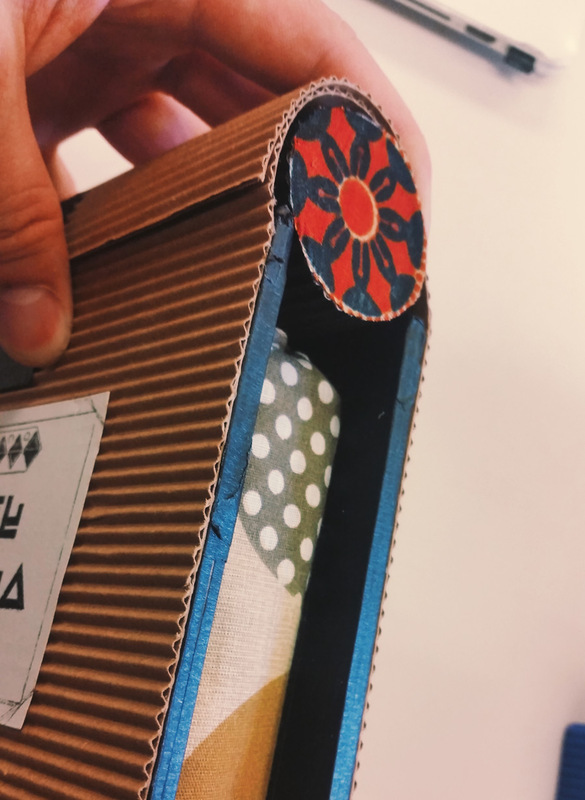 The solution I ended up with was actually combining the packaging with the game board so that they became “one.” This was also a solution to the question of sustainability, an overarching question throughout the course, in that merging the two would reduce any waste. • Object: Two players compete against each other trying to get as many stones as possible before one of the players clears his or her side of all its stones. • Set Up: The players sit facing each other with the board between them. 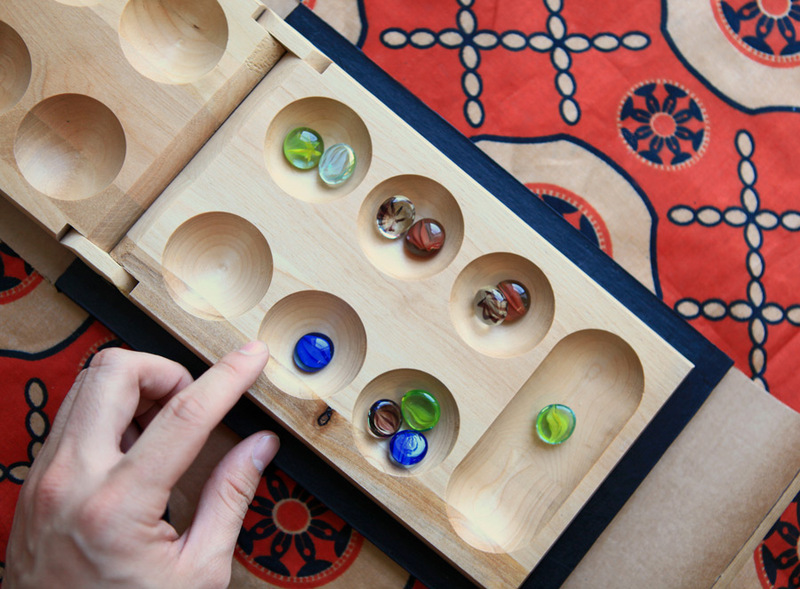 Each player is allocated the row of bins closest to him or her and a larger scoring bin, called a mancala, to the right. Four stones are placed in each of the 12 smaller bins. The players decide who goes first by flipping a coin. • Play: The first player picks up all the stones in any of his or her six bins. 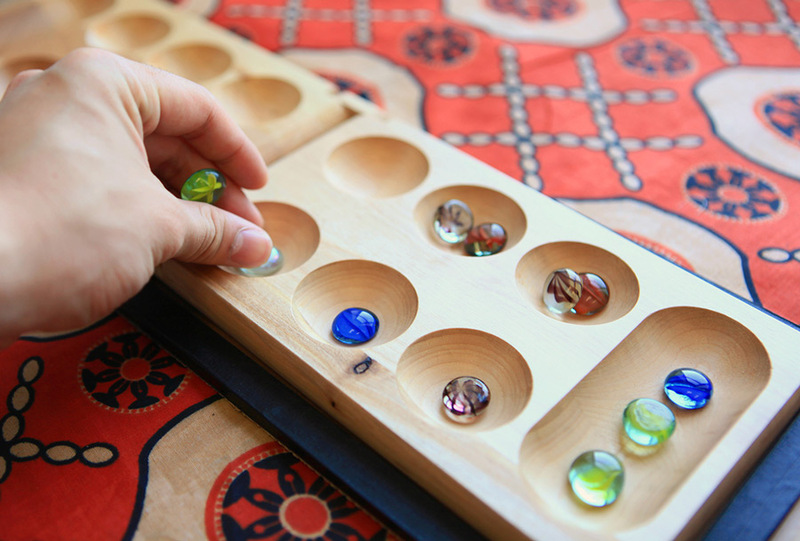 He/she then places, consecutively, one stone in each bin to the right (counterclockwise) around the board, including his/her own mancala, but not the opponent’s mancala. 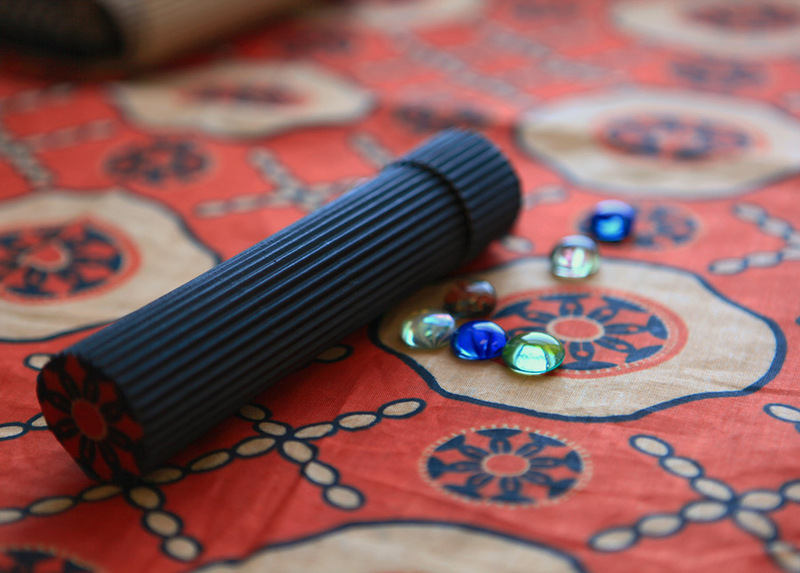 If the player places the last stone in his/her own mancala, he/she is done with their turn. If the last stone is placed in an empty bin on the player’s own side, he/she gets all the stones in the opponent’s bin directly across from his/her bin (if there are any stones). 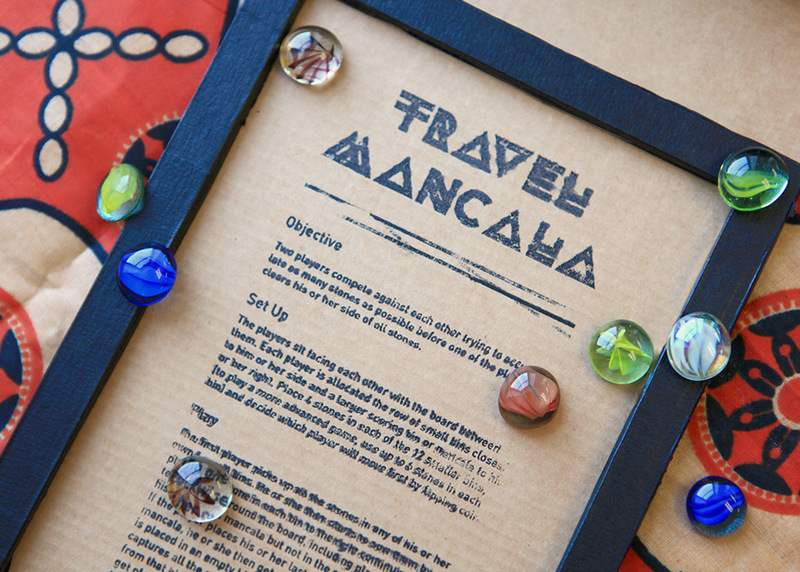 All captured stones plus the capturing stone go in the player’s mancala. 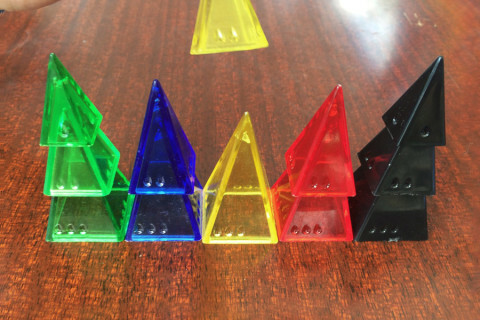 • Winning: The game ends when one of the players runs out of stones in his/her small bins. When this happens, the other player gets to place any stones remaining in his/her bins into his/her mancala. The winner is the one with the most stones in his/her mancala. 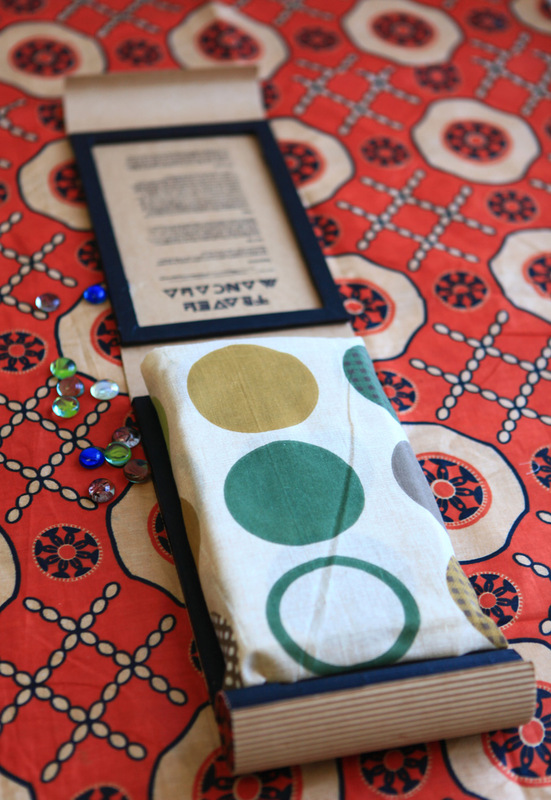 The Mancala wooden gameboard itself is securely wrapped in an ethnic tribal fabric intended to avert damage as well as hint at its cultural roots. Acting as a safeguard, the fabric repels any potentially harmful moisture and fluids. As for the packaging, it is constructed out of e-flute corrugated cardboard which is commonly recognized as a sustainable low-cost material. On the interior, I adhered two frames made out of chipboard and black masking tape to each opposing side. 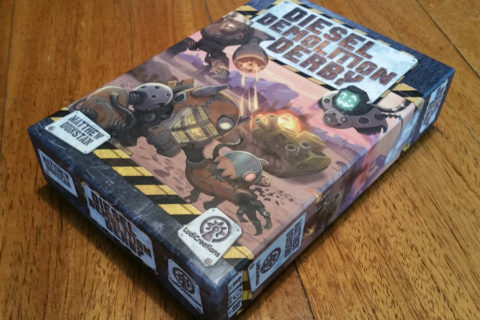 This way when you open up the actual packaging, the game board will ease into its designated frame comfortably. One of the sides has instructions for the game transferred on top, reminiscent of residual texture in pit marks on the ground. Finally, tucked away towards the top of the packaging, there is also corrugated cylinder container with the marbles carefully tucked inside. When the wind blows, Wendy goes wild!